golden arrows rained down, a charioteer looked back at the archer standing behind him. who was he shooting at? i looked to the left. a man stood on another chariot holding the reins as a pair of horses reared, one of the chariot’s wheels seemed to be stuck in the mud and a warrior in reddish orange and gold was beside it perhaps trying to get it out. who were they? even though my mind wasn’t articulating clearly, i knew it was karna… a terrible death approached on the battlefield of kurukshetra. 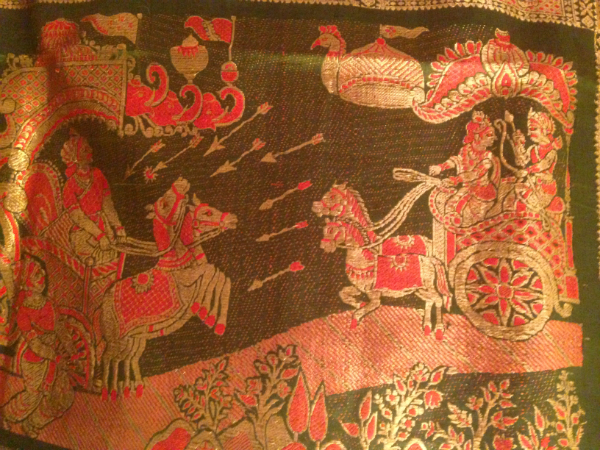 there were arjun and krishna on that chariot and the valiant, righteous, unspeakably wronged hero of mahabharat was going to die right here on the anchal of my saree. 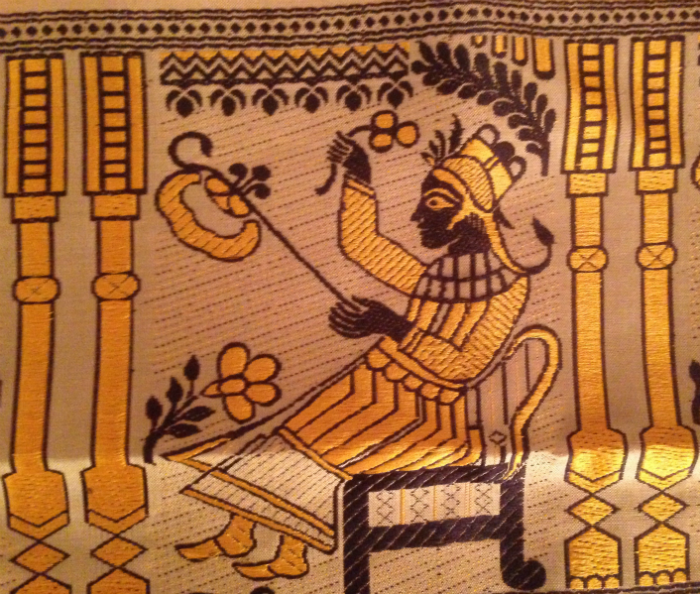 karna, about to be struck, in a woven still frame draped on me. 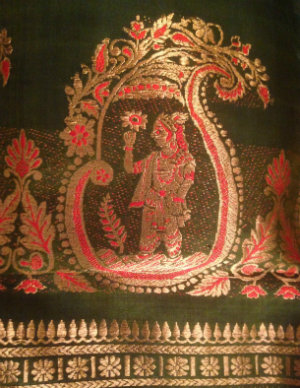 i continued with my inspection of the motifs on a favourite baluchari saree in green. soon at the edge of pallu/anchal, in neat squares, came up the visual of a newborn in a basket, little waves patterned below it, a woman knelt in front and up there was the sun. it was the sun god, karna’s father, blessing the baby. the birth and abandonment of karna. his mother, the not yet married kunti who merrily disposed of him, has just pushed him onto the ganges. did she ever wonder if her first born, whom she had without thinking of the consequences, might die? did she even care? no one was fair to karna i thought, his mother, indra, draupadi… no one, perhaps not even krishna. maybe that’s why the unassailable loyalty to duryodhan who was wrong but who gave him face, trust, even love. balucharis with gold zaree work are called swarnachuri, if i am not wrong. swarna is gold. in another motif, it looked like karna being blessed by parashuram; in a stylised paisley or kalka stood krishna with his peacock feather decked headband and sudarshan chakra. i couldn’t recognise the story on the border, of a man and a woman in a forest, she stroking a beautiful deer. 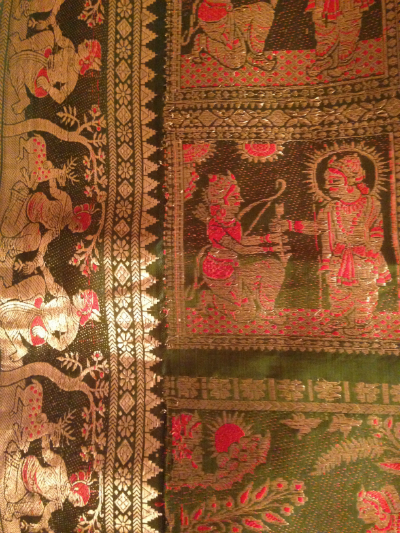 the butas or motifs on the body of the saree were of a girl with a deer. 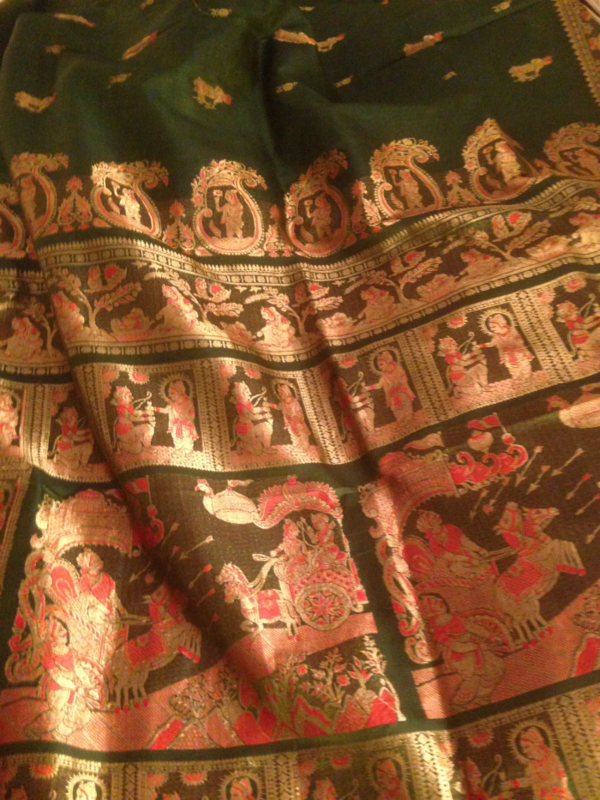 the weaver might have told two stories from the mahabharat in this saree. i wasn’t sure. i’d first heard of balucharis when i was around twenty, they were silks from bishnupur in west bengal and they had complete tales from our mythologies woven in their borders and pallus. sarees that were like story books. i had been fascinated, my mother though said she didn’t like sarees with not too well crafted human forms and animals all over them. 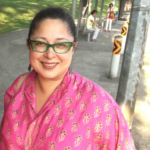 no wonder i’d never seen a baluchari in her wardrobe. my very first baluchari was my younger brother’s wedding gift to me. a smooth thick silk in cream, with elegant small paisleys on the body in subtle brown and a sleek vibrant blue, borders and pallu with fine weave in the same colours. i never looked carefully at the pictures, never “read” the story, just loved the feel of the whole thing. 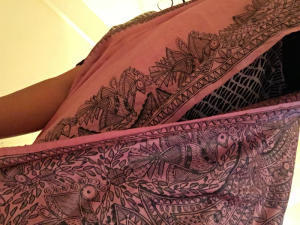 the saree is gone now, frayed and torn, but the memory stays. soon after losing it, i heard that a dear aunt of mine had a baluchari seller visiting her regularly, with sarees straight from the weavers. the green one here and that other grey and black one with highlights of yellow and motifs that look clearly like something from the mughal era, perhaps the sultans of bengal, both are from her baluchari man. she’s bought me several over the years. 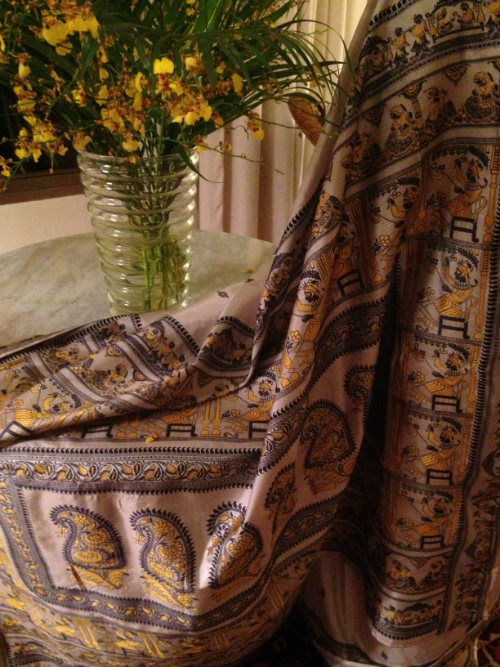 bishnupuri silk is dense yet light with a smooth svelte feel. the sarees are so easy to wear. and i can’t get over the colour combinations, from elegant to completely unorthodox; sometimes you’ll see the brightest/strangest shades on a saree and yet the effect will be classy and poised. 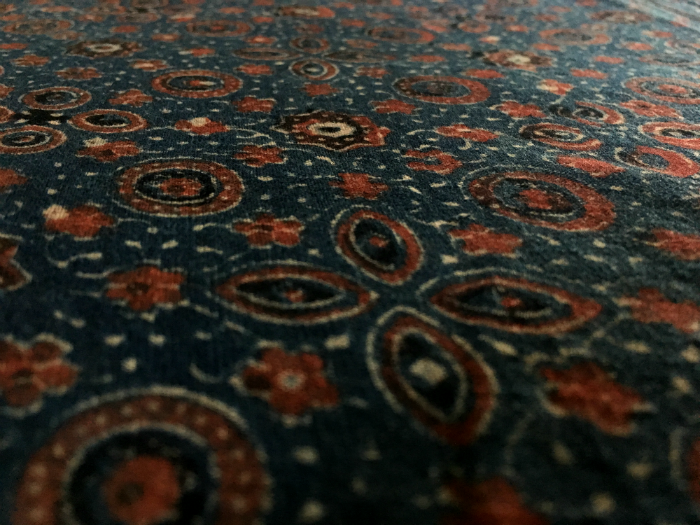 my aunt always remarks on the innate ability of the “taanti,” the weavers… and the very small amount of money we pay for these absolutely non-designer unusual pieces. i think the most i’ve paid for a baluchari has been rupees seven thousand. while pondering on the baluchari, my thoughts suddenly went to another famous battle field. polashir juddha, the battle of plassey. i thought of robert clive, all of thirty two or whatever he was at the time when he won the battle and established a british company’s rule on a part of india. why was i thinking of clive i wondered. what was the saree trying to tell me? baluchar, which means sand bank, was a small town on the banks of the river bhagirathi, a tributary of the ganga. in the early 1700s nawab murshid quli khan, the diwan of bengal under aurangzeb, moved his capital from dhaka/dacca to maksudabad nearby, renaming it murshidabad after his own name (nice nawabi thing to do, i guess). the baluchari came into being around this time and became popular. 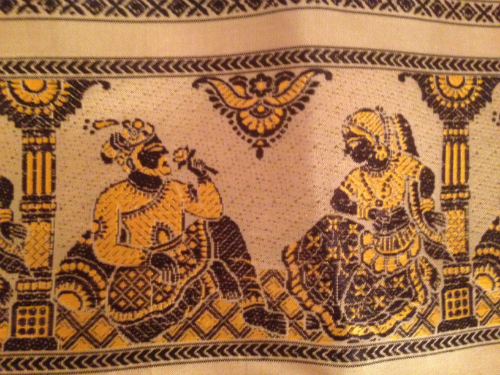 the mulberry silk was locally cultivated, weavers from gujarat may have been involved in the creation of its idiom and texture. although the mughal empire was in decline, murshidabad became a thriving trading port and had many marwari traders, gujaratis, armenians, arabs, jews, dutch, french, english, and other merchants living there. 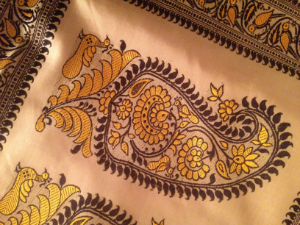 textile was of course one of the many things india was known for and exported. baluchari also found its foreign takers. its motifs back then reflected the life of the mughals, the court, the zamindars, etc., and held up a picture of the times. when clive and company rule arrived in 1757, and the capital moved to calcutta twenty five years later, the baluchari continued to flourish. it neatly adapted to its new environment, the motifs started to depict scenes from the life of the british, the changing times. if earlier there were nobleman on horses and elephants, now they were also on steamers, even trains. there were bibis with their hookas and englishmen in indian gear. but somewhere along the way, for all sorts of reasons, baluchar lost its relevance and the weave almost perished. thankfully, looms went up in bishnupur in another district of bengal and the craft continued. 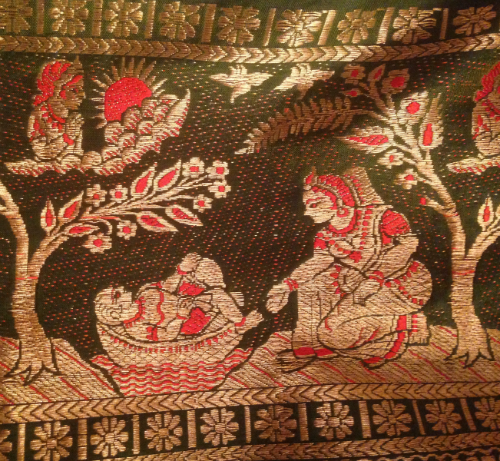 master weavers such as dubraj das kept the tradition alive, adding new motifs and dimension. interestingly, despite its intricate craftsmanship and rich stories, the sarees were not favourites among the wealthy ladies, muslim or hindu, of mid nineteenth century bengal. even the brahmo bhadramahilas preferred banarasis and rarely chose balucharis… like my mother, i thought as i read that on a website. perhaps the motifs were too edgy and not done to wear. imagine a bibi smoking her hubble bubble, snuggling up to an englishman in angarkha and turban on your pallu. okay, pass the smelling salts. 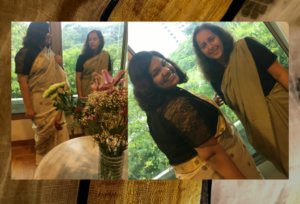 balucharis might have disappeared but for the artist shubho thakur, who in the mid 1950s started reviving the art, and it’s most likely thanks to him, i have my sarees. i wonder when the motifs became those of our mythologies and left the realm of mere mortals and their shenanigans. i wonder also if there was ever one with the story of the battle of plassey, of clive, of the betrayal by mir jafar, of siraj ud daula. 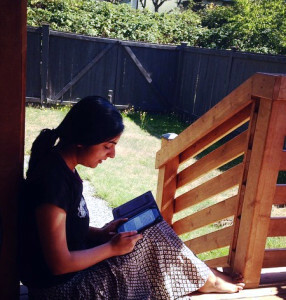 of how this language in which i write came and took root in our world. karna died, killed by his own brother. i just checked a pink and brown saree and here “sitaharan” was in progress, ravan and sita in a flying chariot, jatayu trying to save her. 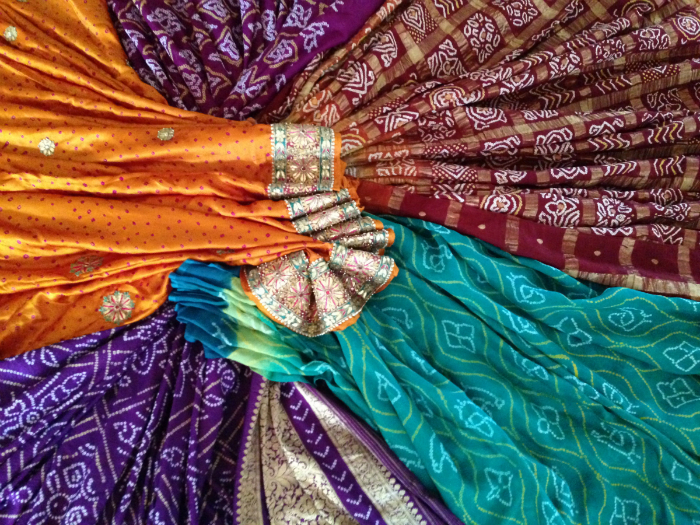 a sense of jatra, the bengali theatre, in these silks. 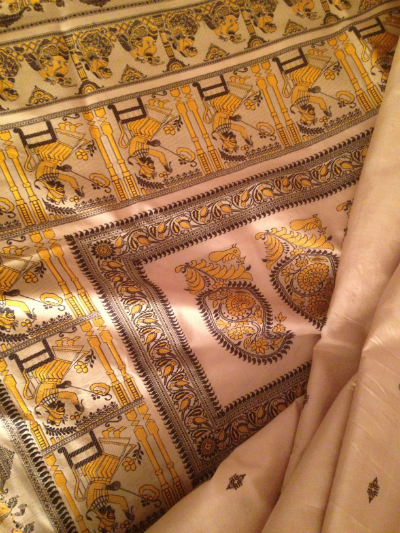 who is that mughal reclining on the border of the pale grey saree? that lovely girl in a ghagra? the man sitting on a chair holding up a three-leafed something and a fan? what is their story? must call my aunt right now and tell her to get me another baluchari. 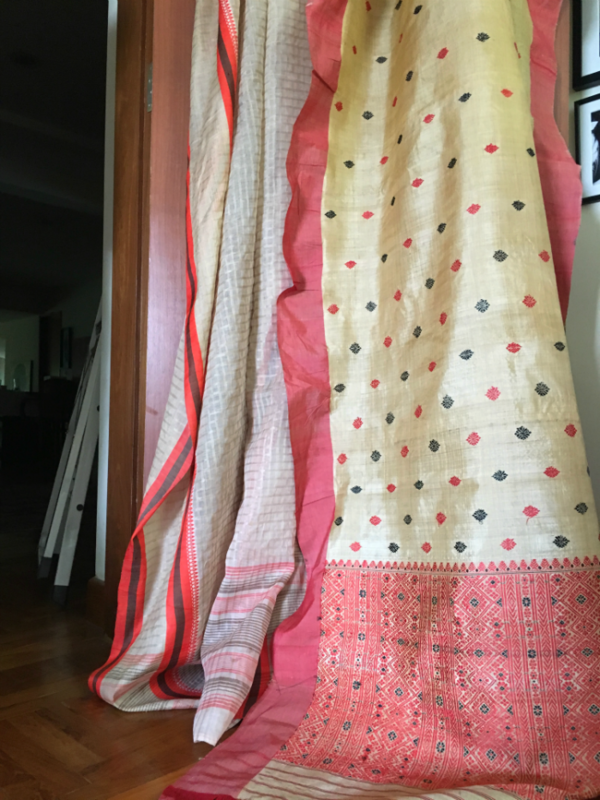 sarees tell stories | a green shot silk baluchari with orange and gold zaree motifs/pallu/border and a pale grey baluchari with black and yellow work, both from a baluchari seller who comes carrying sarees from weavers, bought around 2007 and 2014 in calcutta. Karan has always had a hard time with women.. now dying in your saree’s aanchal.. sad sad life for the man. I haven’t worn Balucharis since I feel they are too heavy, but I hadn’t ever noticed why they were that way. They tell stories, and such lovely ones. No wonder there is all that work. Amazing..
karan… no one was fair to him. only the man considered absolutely rotten. 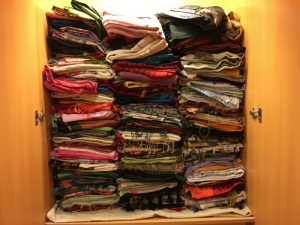 you know balucharis aren’t for everyone… my mother found all that story telling over the top and not her thing.. imagine people leaping all over your saree, she’d say. she did buy a tussar one once, but without story. you get those too, in fact they are less expensive. and nowadays it’s hard to get the quality of weave and artistry you got even thirty years ago. balucharis have never enjoyed an out and out popularity… and i think all these mythology stories came later, the earlier ones spoke of real life maybe? or big characters from there. 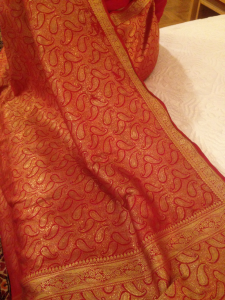 the silk is fine and soft though, and the sarees are very easy to wear. maybe you’ll try one? thanks so much for reading. I have never seen a ‘baluchari’. But what an interesting concept. The humble fabric has done its part in bearing witness to history… but this is at par with the drawings on the cave walls. I wonder was the first such sari made as an offering to a Begum? In the manner of the poems that were written in praise of the Nawabs. Did it depict a scene immortalizing a particular heroic act? And then of course bowing to the flavors of time the stories shown probably changed. After all by that time we were running out of heroic acts as well. I can tell you why Muslim ladies were most likely not wearing such sarees. Islamic art discourages portrayal of actual human form. Of course we don’t let it hold us back too much, but it could be the reason for the sarees’ lack of general popularity amongst Muslim women. Thanks for sharing this piece of history Indi. We are losing artisans and handwork skills passed through generations in face of the ease of machine creations in our part of the world. What was commonplace has now become extremely rare. So I am doubly glad that ‘balucharis’ survived. Now next question… where I wonder I can lay my hands on one? thanks for reading. not very well known outside bengal i think these sarees; okay, now with boutiques sourcing sarees from other states, yes, some people do know of it, but not many. actually the silks of bengal or assam are not top of mind for most while considering a nice splurge on a saree. 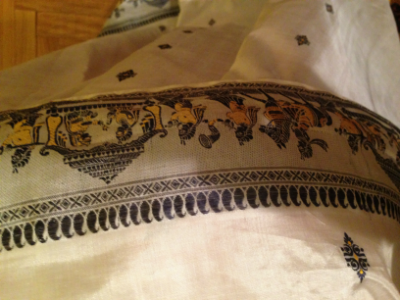 i too wondered when the first baluchari was woven and why and for whom, just found a couple of ponders on it on the net, no clue about that… why a story telling saree at all? they have been compared to the pat paintings of bengal, but given their unique expression you’d think these would be star sarees, but no. you are absolutely right no doubt about why the muslim ladies left it alone, but why the brahmos… though brahmo samaj also moved away from form and image. the craft has survived however it doesn’t thrive. and to get a fine piece is tough… the one i was given 30 years ago certainly was of better more dextrous workmanship. but i still can’t stop wanting one. 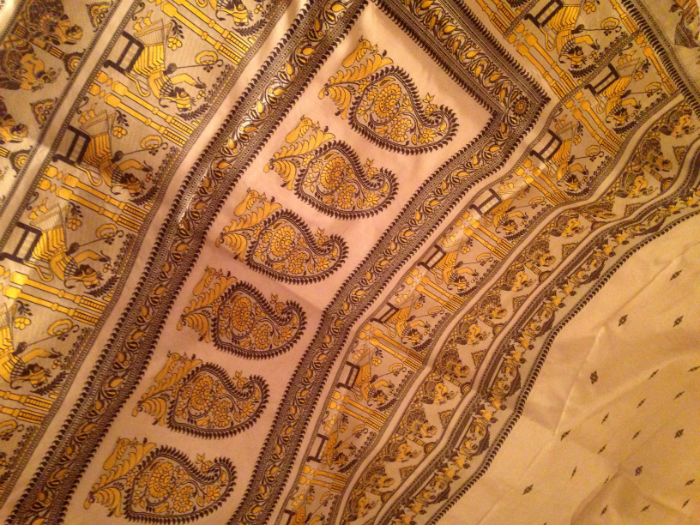 you should be able to get them in calcutta… try kanishka, their sarees are usually nice, of good quality (they’re on facebook and do get back to you if you post a query https://www.facebook.com/kanishkaskolkata/), i just found this link http://www.parinita.co.in/pages/baluchari … they may have something. you might get them at the handloom house as well. nowadays i just depend on my aunt to pick up one from the saree seller who comes to her place. hope that info helps and you get yourself a lovely one. and don’t get me started on the disappearing crafts and arts and things once commonplace… and the dominance of bland and faceless and machine made (maybe a machine thinks of them too, that heartless stuff) fabrics and ideas everywhere. even the basic pure cotton is vanishing.